Exclusive gated Beach Colony Resort is located on 700 Feet of fabulous sugar-white sand beach framed by the crystal Gulf of Mexico. The gated community in Perdido Key boasts 11 acres of palm-lined drive and beautifully landscaped property. Beach Colony offers the amenities of a world-class resort: indoor heated pool and hot tub, 2 outdoor pools, Har-Tru tennis courts, state-of-the-art fitness center and grilling areas. There are three buildings with 2 elevators per building and 4 units per floor with a semi-private entrance. 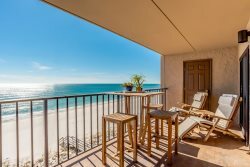 Each condominium unit has a 300 SF circular beachfront balcony with endless beach views. Spacious, modern two bedrooms, two bath units or three bedrooms, three bath units are available. Granite counter tops in kitchen and baths are standard. Beach Colony is located on the east end of Perdido Key and a short walk to the pristine National Seashore. It is also convenient to grocery, restaurants, shopping, and attractions.